Sweater: Topshop similar less expensive styles here, here, and here | Denim: Old similar here | Booties: Forever 21 (sold out) similar here and here | Sunglasses: Ray Ban | Lipstick: MAC in "Velvet Teddy"
I finally got around to sharing this look on here! If your looking for the perfect holiday sweater this is it! 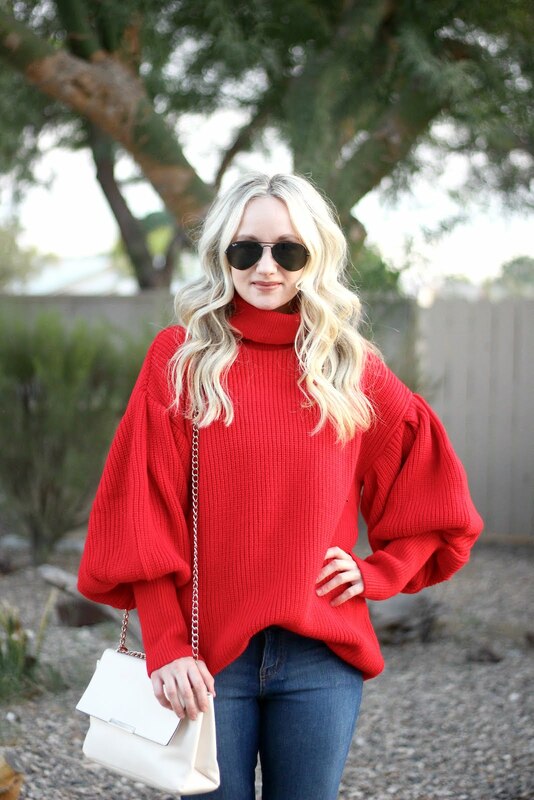 I love the bright Christmas red color and the big puffy sleeves. You can pair it with a sequined skirt or jeans, or even a lace skirt. Add a pair of pumps and your Christmas party ready! I also linked some other similar less expensive styles above or in the widget below.